Pandora- the World of Avatar is officially open for business. The land, modeled after James Cameron’s immensely popular film Avatar, is the largest expansion in Disney’s Animal Kingdom’s history. I was invited by Disney to attend the media preview of Pandora and once again, Disney blew me away with its rich storytelling and attention to detail. I truly felt like I had been whisked away into an other-worldly tropical paradise (Florida’s balmy air and afternoon thunder storms helped set the scene). Here are 10 “can’t miss” experiences awaiting visitors to Pandora Disney. Upon your first glimpse of the Hallelujah Mountains, those iconic floating mountains of Pandora, you will quickly recognize you are someplace special. The Valley of the Mo’ara is a lush tropical paradise with all sort of other-worldly plants, delicate waterfalls being blown like ribbons in the wind, and Alpha Centauri Expedition tour guides mingling about ready to immerse you in the world they can’t wait to share with guests. Don’t miss the panopyra plant; rub it in a special spot and it will shoot out a mist that purifies the toxins in the Pandoran air. Good to know: Unlike most other areas of Disney Parks, there are no Hidden Mickeys in Pandora. Residents of Mo’ara come to the drum circle a couple times a day to put on a performance for visitors to their exotic land but when the show is not in session, take a couple minutes to bang on the drums yourself? Why? Why not! Na’vi River Journey is one of those classic ‘great for all ages’ dark rides that Disney does so well. Your boat floats slowly down the river which cuts through a bioluminescent forest filled with glowing plants, unique wildlife (I am partial to the Viperwolves), and the sounds of peaceful sounds of the night before reaching the ride’s true highlight, The Shaman of Songs. 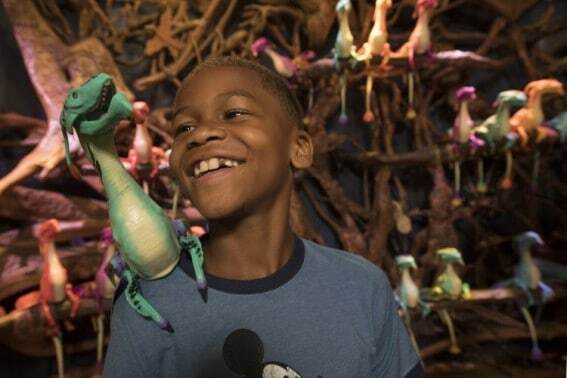 The Shaman is brought to life using Disney’s most advanced animatronics to date. Her swaying movements and piercing eyes are incredibly realistic. Her song is hauntingly beautiful. Pongu Pongu means “party party” in Na’vi and the boba ball drinks at this little shack are most certainly a party in a glass. For those who prefer their drinks to be non-alcoholic, the Night Blossom is a great fit. 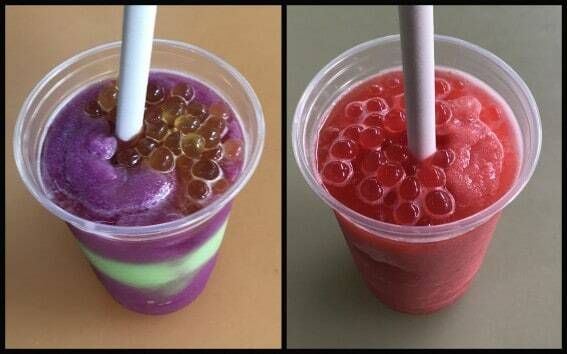 This blended frozen drink combines pear, apple, and limeade flavors topped with passion fruit boba balls. Those of us who enjoy a little buzz in our brew will love the strawberry and blood orange flavors of the blended Mo’ara Margarita. This tequila-laced treat is topped with plenty of strawberry-popping boba balls. Tasty and fun! Designed to look like the former mess hall for the Resource Development Administration base in the Valley of Mo’ara, Satu’li Canteen is Pandora’s restaurant. 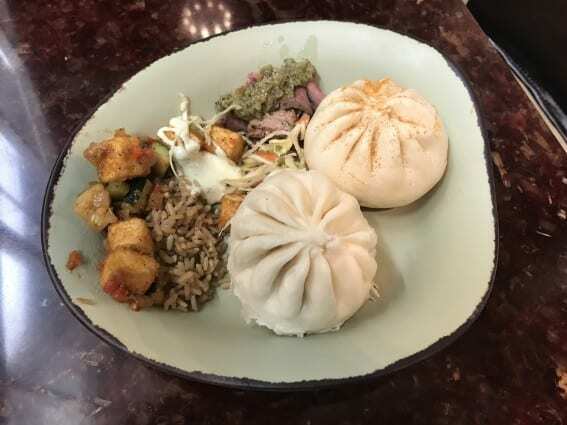 The menu reflects the healthful bounty of the valley in its menu with a variety of meat, grain, and veggie bowls on the menu as well as various “pods” which are basically bao bao buns filled with either vegetable curry or a cheeseburger flavored concoction. The portability of these buns make them perfect for munching on while in the queue for one of the rides in Pandora. Dessert comes in pod form as well. Your choice is either a round, molded chocolate mouse or blueberry cheesecake. 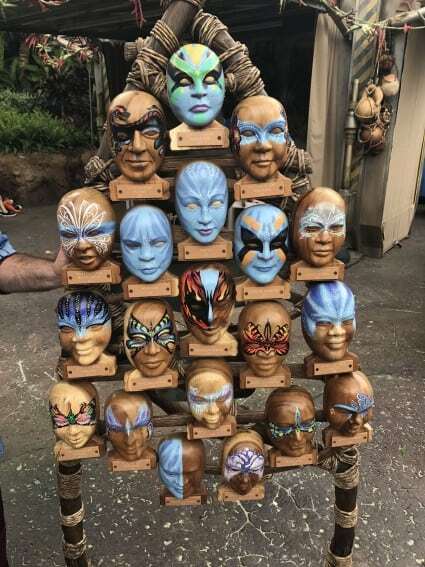 There’s the typical princess or Spiderman face painting you will find at your average carnival and then there is the Mo’ara face painting that can be found in Pandora. These fun designs allow kids to look like the blue Na’vi, with plenty of sparkle and detail to boot. Top them off with a eared-headband from the Windtraders gift shop and they can pass as Pandoran locals! 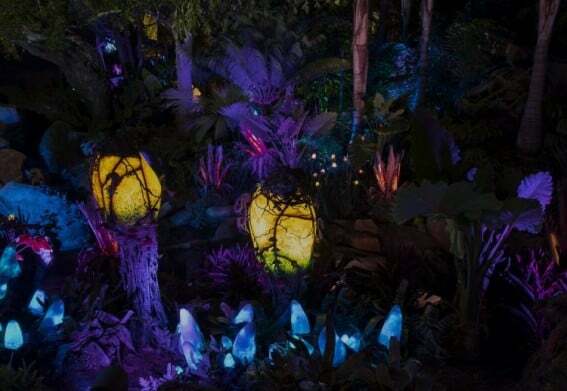 Nobody likes waiting in line, but the queue for Pandora’s premier attraction, Avatar Flight of Passage, is an experience you definitely won’t want to miss. 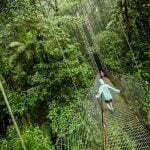 It begins with a trip up a hill through the tropics of Mo’ara; bridges serve as overlooks to panoramas so breathtaking that you can ‘t help but stop and break out your iPhone for a shot. 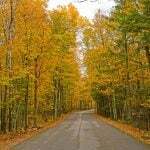 Banshees scream in the distance, and you begin to believe you have been transported to another world. Eventually day becomes night and you are wandering through a glowing bioluminescent forest alive in shades of purple, blue, and fuchsia. Finally, you pass the rusted, moss covered entrance to a PCI research laboratory where creators of Pandora are being studied and you get a goose bump-inducing view of a 10-foot-tall blue Na’vi floating around in an incubator. Pure Disney magic. Trekaroo Tip: Be sure to take advantage of Fastpass+ and book your Fastpasses for this ride as soon as your 60 day window opens. 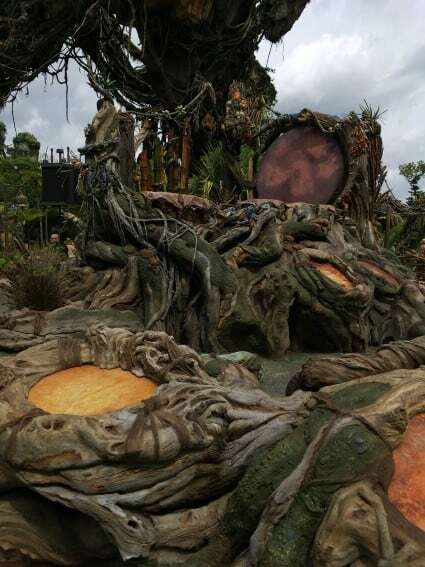 The stand-by queue for Flight of Passage is designed for a capacity of 4-6 hours in length. After making your way through the queue and two videos which link ride-goers to their avatars, you finally enter the room where a motorcycle-like apparatus and a pair of 3D glasses take you on a ride unlike any other. 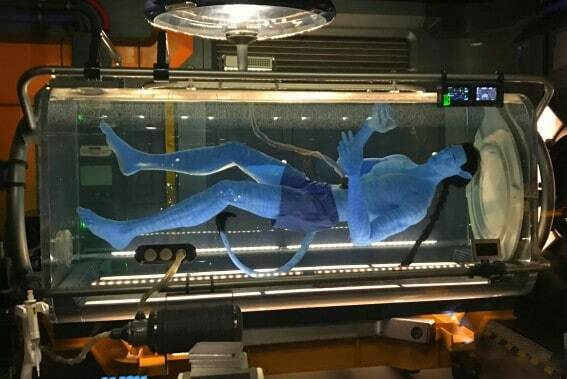 The technology used on Avatar Flight of Passage is similar to Soarin’ but with a whole new thrill level. Pleasant scents, mist, and a constant blow of wind in your face immerse your senses as you zip through Pandora on the back of a banshee. Though the scenery in front of you is captivating, you won’t help but notice the feeling of the banshee’s labored breathing in between your legs. Four minutes is simply not long enough. Be prepared for the let-down when you return to Earth. 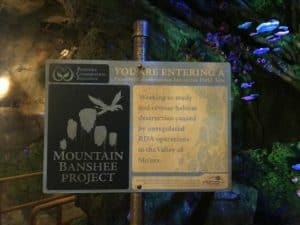 You’ve just ridden a mountain banshee and the ride exit has plopped you inside Windtraders, Pandora’s souvenir shop, so why not take home a mountain banshee of your very own? Several cool souvenirs such as make-your-own Pandora necklaces and action figures modeled after your own custom-designed avatar can be found inside the shop, but adopting a baby mountain banshee from the Banshee Rookery is sure to become the most popular choice. The banshees are too adorable to resist. They sit atop their owners’ shoulders, squawking and flapping their wings in realistic fashion, allowing families to take home their own little piece of this mystical land. 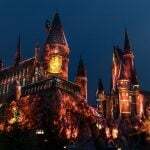 Pandora becomes a quite different place at night. 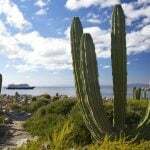 Everything is covered in bioluminescence, from the glowing sidewalks to the tops of the mythical mountains. Creatures call out into the night air and plants seem to be creating their own light. These special effects do create an entirely different experience from what you will enjoy during the daylight hours in the Valley of Mo’ara. 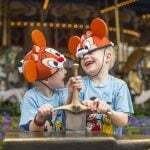 Ready for more tips on exploring Walt Disney World and Disneyland with kids? 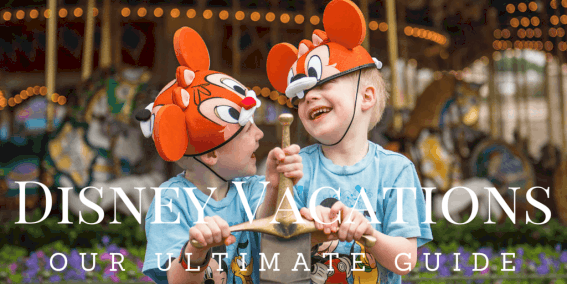 Check out our ultimate guide to your Disney vacation. Photos and video by Sharlene Earnshaw unless otherwise noted. Disclosure: The author attended the media preview of Pandora. All opinions are her own.